Communication has changed vastly in the past 20 years. Digital communication, whether it is via email, text message, or one of the various apps out there have taken over as the primary way people communicate. What implications does this have for property management companies, Fort Worth property owners, and their tenants? How does digital communication affect your landlord-tenant relationship? Below we explore the ways you can communicate with your tenant in the digital age, and reasons you should be wary of this type of communication. Text Message – The Pew Research Center reports that 92% of US adults own a cell phone, and 68% own a smartphone. This means your tenant will almost certainly have the ability to send and receive text messages. Email – Email can be a great method of communication as it allows you to not only give your tenants pertinent information, but you can send and receive important documents as attachments. Messaging Apps – Apps such as Facebook Messenger, Whatsapp, Google Hangouts, and even Snapchat are widely used to message between friends and acquaintances. Using them for property management DFW might not be the best idea though. Text messages and email are a fast, easy, and a reliable way to communicate. Before you decide to use these forms of communication, be sure your tenant is ok with it, and they know it is coming. Ask your tenant what their preferred method of communication is–a phone call, text message, or email. Your tenant will be thankful when you make an effort to reach out in a way that works with their needs. Here are a few things you can text or email your tenant about. Rent Payment Reminder: you or your property manager can set up an automatic system that will send a reminder text to your tenant a few days before their rent is due. Scheduled Inspections: regular inspections are recommended by most property management companies. Fort Worth property owners can use text messaging or emails to schedule and remind tenants of these inspections. Maintenance Reminders: certain items around your property, such as air filters, need to be cleaned or replaced regularly. Use email to remind your tenant to replace these things, or let them know you will be coming to replace it yourself. Scheduling a Face-To-Face Meeting: let your tenant know you are stopping by the house, or try to schedule a good time to meet via a text message or email. Sending Important Documents: documents, especially ones that need to be signed, used to be sent via fax. Now you can scan and send via email. While digital communication is fast and easy, you should not use it for everything related to your property management. DFW property owners should never use digital communication in the following ways. Never send your tenant a Notice to Vacate via electronic means. According to Texas Property Code Section 24.005, a landlord must give their tenant notice in writing either by delivering the notice in person or by regular mail. Do not attempt to change the terms of the lease over text message. Sending an email is acceptable, but face-to-face interaction is preferable to ensure all parties understand the new lease terms. Not every tenant will use digital communication the same way. If your tenant is not replying to texts or emails, find a method of communication that works for them. We have all been there at one point or another–we get an email or a text and misread the message or tone. Maybe the sender was sarcastic, maybe the writing was just confusing. Either way, feelings can be hurt when this happens. In property management the stakes are higher, occasionally leading to turnovers and evictions. However, when you hire a property manager, you take the stress and guesswork out of your landlord-tenant relationship. An experienced property manager knows exactly how to communicate professionally with your tenant. Experience: do the property managers have experience managing single-family homes and communicating in person and digitally? 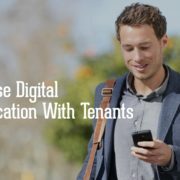 Proven Techniques: your property management company should have processes and techniques in place for every type of tenant, including how and when to communicate digitally. Fewer Vacancy Days, Lower Turnover Rate: knowing how to communicate effectively will lead to fewer vacancy days and lower turnover. Your property manager should always be on top of communicating with applicants and tenants. Specialized Property Management Fort Worth has the experienced property managers you need to run a successful rental property. Call our offices today to set up a free rental consultation.